Be the first to share your favorite memory, photo or story of Mrs. Doris . This memorial page is dedicated for family, friends and future generations to celebrate the life of their loved one. 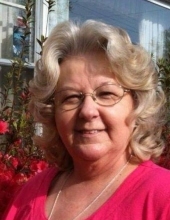 Mrs. Doris Elaine Lamb, 67, of Aiken, SC, beloved wife of Mr. James Earl Lamb, Jr., entered into rest on Friday, January 25, 2019. Born in High Point, GA and a resident of Aiken County, SC, for the majority of her life, she was a daughter of the late Olin and Jane Hitchcox. She was a former employee of Paveway. Doris enjoyed crafting, crocheting and making people laugh. In addition to her husband and parents, family members include her children, Elaine Arpin and her companion, Darrell Adair, Aiken, SC, Edward Bellido, GA, Natasia Lamb and her companion, Bethel Pierce, Tampa, FL, Sue Jordan and her husband, Ricky, Aiken, SC and Lucy Puckett and her husband, Buddy, Aiken, SC; siblings, Joel Hitchcox, Lydia Center and Vanessa Stoker, all of Chattanooga, TN and the late Robert Hitchcox, as well as grandchildren, Dallis and Bradley Blackburn and Sabrina and Tabitha Stein. A memorial gathering will be held on Wednesday, January 30, 2019, from 6 until 8 o’clock at Hatcher Funeral Home and Cremation Service, 3464 Jefferson Davis Hwy., Graniteville, SC. To send flowers or a remembrance gift to the family of Mrs. Doris Elaine Lamb, please visit our Tribute Store. "Email Address" would like to share the life celebration of Mrs. Doris Elaine Lamb. Click on the "link" to go to share a favorite memory or leave a condolence message for the family.